Facebook has released their Quarterly Report for the year 2016. They had posted this in Facebook community update on 27 April 2016. 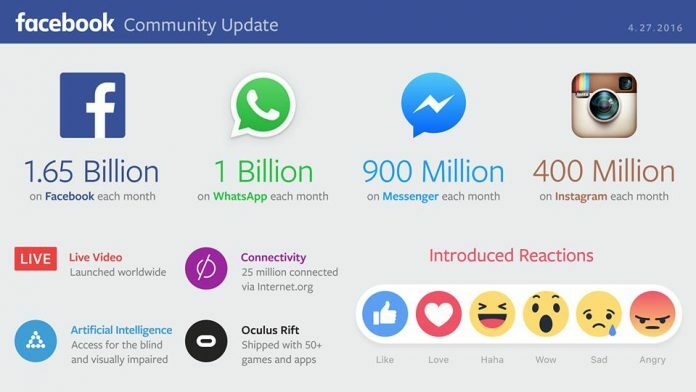 Facebook Community has reached 1.65 Billion users each month in the Q1 2016. Facebook has launched some fresh and unique features this year. Facebook rolled out Live Video, which helps to go live up to 30 min. Launched reactions (Like, Love, Haha, Wow, Sad and Angry) to post using the emoticons. The Oculus Rift had shipped with more than 50 games and applications. 25 Million Are connected via Internet.org. Facebook also focused on Artificial Intelligence for access to the blind and visually impaired. Facebook is working hard on every platform, which makes easy in connecting to the world. The efforts of Mark and his team are truly appreciated in working hard to connect each other across the world. Facebook mentioned their Active users in both desktop and mobile platforms. Here are few statistics, 1.65 billion Monthly active users (up 15 percent year by year), 1.51 Billion Mobile Users (up 21 percent year by year), 1.09 Million Daily Active Users (a 16 percent bump year by year) and 989 Million Daily Active Users On Mobile (a 24 percent increase year by year). The report says that 52% increase year over year. Facebook is accelerating their growth every year regarding users and revenue. Apart from the Facebook they also mentioned the reports for users other applications. For WhatsApp 1 Billion, 900 million on Messenger and 400 Million Instagram active users each month.